A few weeks ago I decided to do a 2-week detox. To ensure that I wouldn’t feel left out when everyone else was sipping cocktails , I made my own “special” drinks – alcohol and sugar-free. This is one of my favorites – perfect for summertime. Muddle the mint leaves in a small bowl and set aside. Bring the water to a boil in a large pot. Turn off the heat and stir in the mint leaves. Set aside and allow to cool for about an hour. Add stevia and stir, then pour into a pitcher or jars and refrigerate for at least another hour. 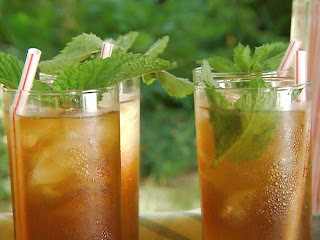 Strain mint leaves if desired and serve over ice.